A simply-furnished bell tent just steps away from a sheltered sandy beach on the Brittany coast. After long days out at the beach, on the coastal paths or on your private deck, meet in the evening around the stove and enjoy the full comfort of this camping experience. This is not camping, this is glamping! Our Atoll Tents have four futons and warm blankets for you to get a real cosy night’s sleep - or take the blankets outside on your private deck and look at the stars. Electricity is provided and wifi as well if you wish to stay connected! The outdoor kitchen and large sitting area on the deck provide the ideal space to enjoy an unspoiled landscape and share those happy moments together, combining the pleasure of camping in the wild with the easy use of a BBQ and a sundeck. Bot-Conan has two bath houses, located only few metres away from the tents and blends beautifully into the landscape thanks to their green roofs and wooden panels. They are equipped with flushing toilets, hot power showers, washbasins and outdoor dishes and laundry sinks. Bath houses are maintained several times a day so they remain spotless. After a swim in the sea, you will find these hot power showers a delight. We want you to enjoy this pristine environnment so the site is car free and complimentary bikes are provided. We are located in an the beautiful baie de la Forêt where you can find great fishing, sailing and outdoor activities. We are close to the charming village of Beg-Meil its local market, nice creperies, good restaurants (as bistro Chez Hubert) and beautiful beaches. Glamping at Bot Conan Lodge : we promise you not just a holiday but a fantastic and unique experience that you will never forget. Our glam camp tents are set in the « Baie de la foret » which gives you a charming fusion of deep unspoiled countryside and a crystal clear water secluded beach meters away. The « Baie de la Foret » is home to a beautiful coastline, with pristine beaches and a wide variety of water-sports that you can easily access from the site. Lodges are arranged in a field with direct view on the secluded beach of Bot-Conan. The site is fenced so children can play safely in the surrounding grounds and the sea is kid-friendly (no currents or big waves, shallow depth). High chairs and baby cots are available on request.Barbecue pit and private wooden picnic tables will enhance this outdoor family experience. Bikes, canoe and paddle boards are available on site. The clubhouse is a warm and cosy place to read in front of a wood fire or to have a snack. You will enjoy our Hot tub and Sauna as well. 12 ‘Archipel’ safari tents, and 4 ‘Atoll’ bell tents. 2 bath-houses (located only a few meters away) with hot showers, toilets, washbasin, and sinks. 2 Archipel safari tents now have private rustic showers and dry toilets. Each tent has its own private deck, outdoor kitchen with two gas stoves, wood stoves coming soon, utensils, cooler box, and dining area. Bed linen and towels are now provided in all tents. High-chair and baby cots are available upon request. Electricity and WiFi are available. A new pub is opening soon on the farm next to the lodge for guests to enjoy. Bicycles can be borrowed on site to go and explore the local surroundings. 12 Archipel 'Safari' tents, and 5 Atoll 'Bell' tents. Glampers, campers, groups, and dogs – yes. Campervans, caravans, tent campers – no. Bot-Conan is located in the beautiful bay of Baie de la Forêt, where outdoor activities come thick and fast. Here are a couple of suggestions to get you started. Overlooking La Foret-Fouesnant bay, Cornouaille Golf Club (0033 298 569709) is a challenging, well maintained golf course set upon the picturesque Atlantic coast. Home to plenty of wildlife including egrets, swans, herons, geese and ducks, Cornouaille is the oldest golf course in southern Brittany. The 18th century clubhouse is a converted manor house that offers meals, snacks, and a friendly bar where you can enjoy a post-round drink. Concarneau, a likeable fishing port, is only a short drive away. This charming walled town makes its living from the fishing industry, and catches more than 100,000 tonnes of tuna every year! The Musee de la Peche (0033 298 971020) is an interesting little museum that gives an educational introduction to how fisheries operate. Make sure you head outside and explore the engine room, galley, and bedrooms of the old trawler. For cider lovers, the annual 'Fete des Pommiers' (Festival of the Apple Trees) takes place in July and features music, dancing and plentiful amounts of the celebrated brew. Bot-Conan Lodge is also close to the quaint village of Beg Meil which has a lovely local market, creperies, and good choice of restaurants. Bistrot Chez Hubert (0033 298 949804) is a cosy little restaurant with a big atmosphere. The high quality menu is varied, with the seafood being particularly tasty. There are no onsite catering options, however local produce can be sourced if requested and a pub is soon to open on the farm directly next door. 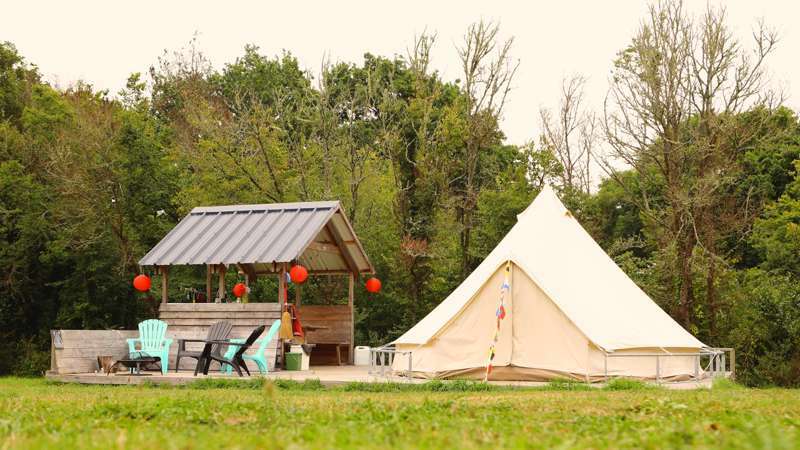 When it comes to glamping sites in France, Bot-Conan is one of the most conveniently accessible from the UK. Brittany Ferries (0871 244 0744) offers direct sailing into Brittany with their Plymouth to Roscoff route (6-8 hours, overnight crossing available.) Bot-Conan Lodge is then a 1-2 hour drive from Roscoff ferry terminal. The site can be easily reached via Quimper (20km) airport and train station. Paris is a 5-6 hour drive.